258 pages | 43 B/W Illus. 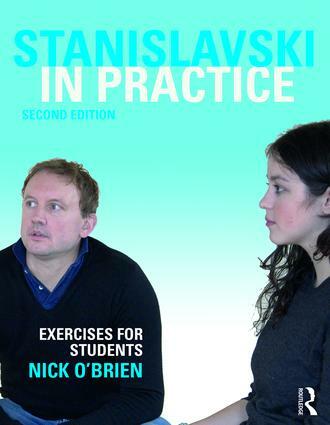 Stanislavski in Practice is an unparalleled step-by-step guide to Stanislavski’s system. Author Nick O’Brien makes this cornerstone of acting accessible to teachers and students alike through the use of practical exercises that allow students to develop their skills. This second edition offers more exercises for the actor, and also new sections on directing and devising productions. Each element of the system is covered practically through studio exercises and jargon-free discussion. This is the perfect exercise book for students and a lesson planner for teachers at post-16 and first year undergraduate level. Exercises are designed to support syllabi from Edexcel, Eduqas, OCR and AQA to the practice-based requirements of BTEC and IB Theatre. A new chapter going beyond Stanislavski, exploring exercises from Michael Chekhov, Maria Knebel and Katie Mitchell. Nick O’Brien trained as an actor and director for four years under Sam Kogan, who was a pupil of Maria Knebel, one of Stanislavski’s pupils in Moscow. He has a PGCE from Keele University, UK. Nick founded and runs The Stanislavski Experience delivering workshops and teacher training in the UK and abroad. Nick has written Theatre in Practice, also published by Routledge, and created the Stanislavski in Practice films.